ISLAMABAD, Pakistan -- Conservation work at the Buddhist site `Ban Faqiran’ atop Margalla Hills in the federal capital has still not started owing to negligence of the concerned authorities. According to an official source, excavation work on the site of 2,000 year-old `Ban Faqiran’ was completed in March and the Department of Archaeology and Museums (DOAM) was supposed to start conservation process. The source, added that various important archaeological sites in the capital including `Sarai Kharbuza’ and others are eroding away after being exposed to natural elements and damage by locals and lack of preservation efforts undertaken by the authorities. The sites, after excavation, require conservation measures by experts from time to time and its preservation is supposed to continue on a regular basis in order to save the heritage site. 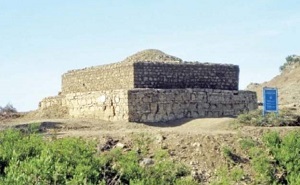 Excavation of the fourth heritage site of `Ban Faqiran’ in the capital was the first field activity undertaken by DOAM after the 18th amendment was passed. Antiquities excavated from the site were housed in a museum for further research, imparting education, promoting tourism and providing recreation to visitors. The objective of this project, worth Rs2 million, was to reconstruct the ancient cultural profile, establish antiquities and explore, excavate and preserve potential archaeological sites in the federal capital, the source added. Funds for excavation and preservation of this Buddhist site had been provided by the National Fund for Cultural Heritage (NFCH) in April 2015 and excavation work began in August 2015. One large stupa-like square structure, measuring 10.26m a side, was excavated on top of the Margalla Hills. The structure was made out of lime and Kanjur stone, with semi-ashlar and masonry dating back from the second to the fourth century Common Era (CE). Furthermore, archaeologists recovered six coins and four iron arrowheads from the Buddhist site in what was at the time termed a major find. A water tank and a mosque was also discovered at the site.